The beginning of the guided tour takes place at 9:30 am and 3:30 pm on a daily basis. If possible, try to schedule the tour on a clear day. We are comparing Helicopter Flight, Walking Tour and Boat Cruise Barcelona Premium Small Group Prices from leading ticket suppliers and Try to find you Cheap tickets prices on the market. A comprehensive overview of the city of Barcelona from every possible perspective - air, land and sea. An informative tour of the downtown area, its medieval streets and structures narrating the city's interesting history. A chance to take unique photos of the seaside town from a helicopter. A boat tour taking you closer to modern structures of the waterfront on board a Turkish Goleta (April-October) or eco boat (November-March). Taking the tour is a great activity for everyone wishing to learn interesting facts and secrets about Barcelona. You will have to walk over three hours during the tour, so ensure you are at least in average physical shape. A flight by helicopter is part of the experience, so make sure that you aren't sensitive to height. Your Experience With Helicopter Flight, Walking Tour and Boat Cruise Barcelona Premium Small Group? Walk streets of the Old Town and explore hidden squares and winding alleys of the Gothic Quarter. Explore beautiful churches and cathedrals, see governmental structures and admire La Rambla, the main street of Barcelona. Take a short, but exciting helicopter ride providing a view of the city from the bird's perspective. Join a waterfront boat tour that allows you to observe beaches and skyline of the Catalan capital and the surrounding mountains. What Helicopter Flight, Walking Tour and Boat Cruise Barcelona Premium Small Group Includes? 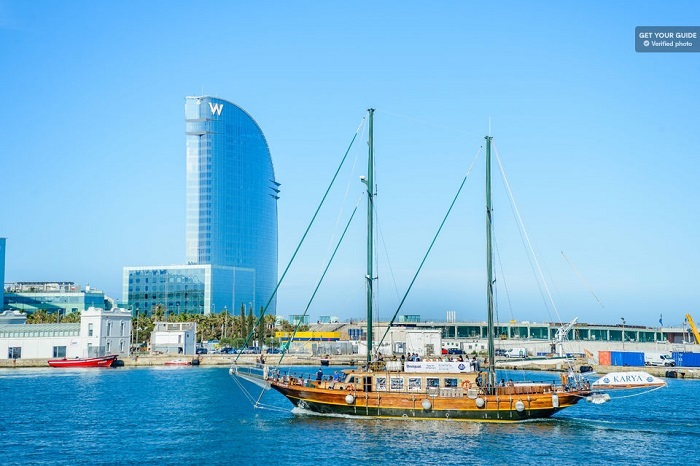 A 40-minute boat tour along the waterfront of Barcelona. Professional guidance by a certified and knowledgeable guide. Small groups, up to 15 people, for a better experience. Barcelona Old Town and its Gothic Quarter. A boat ride along the waterfront to the helioport. Flight by a helicopter over the capital of Catalonia. To board the helicopter, you need to present the valid ID card or passport. Children between four and eight years of age pay only half the price. Kids younger than four don't pay the ticket. People weighing between 110kg and 130kg (242lbs and 286lbs) pay the double fare at the helioport. Travelers Reviews about Helicopter Flight, Walking Tour and Boat Cruise Barcelona Premium Small Group? The vast majority of people that joined the tour underlines the professionalism and knowledge of tour guides, with a fair share of them recommending a different guide every now and then to future participants. Travelers also have a high opinion about the overall service. In the case of bad weather for a boat ride or flight, the staff issues vouchers for another day. Depending on personal interests, holidaymakers that took the guided tour state that the highlight of their experience was either a historical overview or the flight. Comments of various travelers imply that the tour is a must, even if you need to stretch your budget. Both printed and electronic vouchers are acceptable for this guided tour. You need to arrive at the gathering point 15 minutes before the scheduled time. Bring extra clothing for weather conditions aren't the same in the city, on the sea and in the air. The meeting point is at the Carrer Monthuic del Bisbe 3-5 address, next to the Barcelona Cathedral.